As of June 2017, about one quarter of the US population did not have access to broadband internet. This includes 16 million or 28% of rural residents, and 62 million or 23% of urban residents (1). Rates of connection vary widely by city; for example, 19% of NYC residents are unconnected compared with 40% of Detroit residents (2). In recognizing that internet access is vital to managing, navigating and participating in life in the 21st C, some communities and municipalities have taken up the challenge of providing access; one project maps over 800 initiatives (3). In reviewing just a handful of of these initiatives, I have found the variety of interpretations and understandings of, and ways of addressing access to the internet by grassroots community groups compelling. 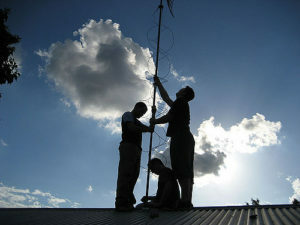 The community and technical networks assembled by these grassroots groups are collectively referred to as “community wireless networks” (CWNs). Urban examples include NYC Mesh, Equitable Internet Initiative (Detroit), and PeoplesOpen.net (Oakland); there are also many rural-based collectives (see reference #3 for more information) as well as international examples (ex. Guifi.net in Spain). This two part blog post series explores the efforts of 3 urban-based CWNs – those named above – highlighting the nuances of their understandings of access, which include but go beyond mere physical infrastructure and service provision. This inquiry reveals much about the challenges and possibilities embedded in these missed connections, and also has lessons for our own work. Continue Reading on Tagging the Tower.